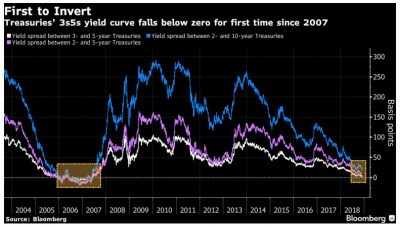 An article published in Bloomberg early last month reported that “a section of the U.S. Treasuries yield curve just inverted for the first time in more than a decade,” with the spread between short-term and long-term instruments dipping to negative 1.4 basis points. Some analysts, however, warn against giving the inversion too much weight. The article cites comments by John Iborg, a portfolio manager at QS Investors LLC who argued that the inversion might not impact performance across the asset class in the near term.